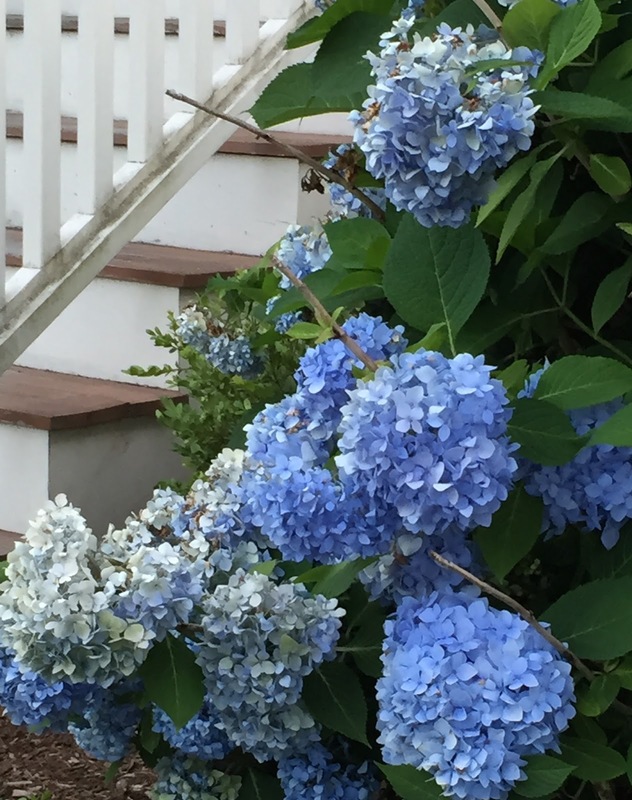 Here in Beverly, MA, hydrangeas are in bloom everywhere. 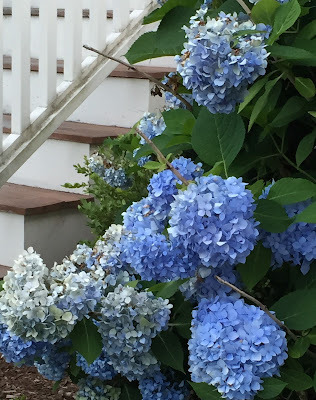 This flower changes colors from spring to fall, and at the moment, the hydrangeas are blue. I saw these on a walk through the neighborhood, and took a quick picture. (Quick because the dog was with us and she has no patience with photography.) I liked the contrast of the blue flowers with the white porch steps. When I transferred the image into my computer, I could see all the problems: dead stems, some brown leaves, and dusty porch rails. So I got to work in Painter to fix the problems with some digital editing. To be continued. . . . Here's a necklace that I finished up a few days ago. The rectangles are flower jade, in a variety of colors. I added wooden beads and metallic accents in copper with a swirled pattern that makes me smile. 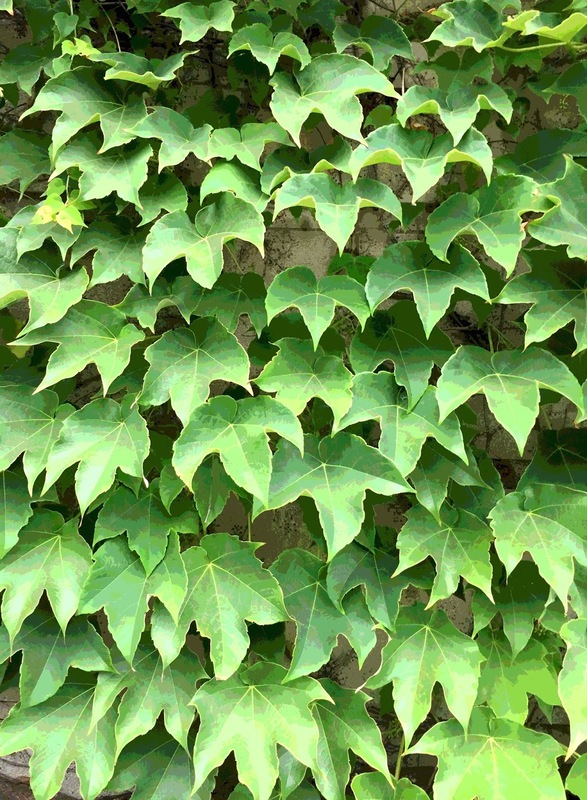 Here is my image of ivy at Harvard Square, this time with the woodcut effect that I applied using Painter. I used Painter to apply the posterizing effect to this photo, a close-in view of ivy growing on a wall at the edge of the Harvard campus. I took the original photo on Sunday during a stop at the Harvard Bookstore in Cambridge. 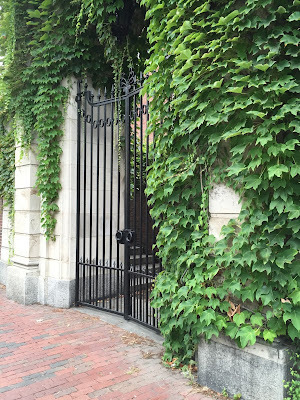 Yesterday we were in Boston, and parked on the edge of campus to stop at the Harvard Bookstore. I took some pictures of the ivy on the wall. (See yesterday's post.) I liked the pattern of the ivy leaves so I took a closeup. 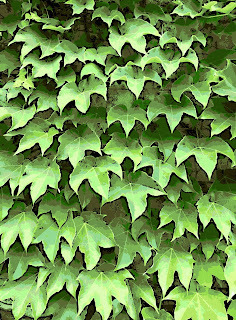 Tonight I opened the original in Painter and used digital pastel to clean up some distracting marks on the leaves and on the wall. I also created a posterized version of this image, as well as a digital woodcut, which I plan to post here too. Today a morning trip into Boston included a stop at the Harvard Book Store. We parked across the street, and I admired this scene as I got out of the car. So I took a few pictures. With this one, I did just a bit of cleanup in iPhoto. I had the idea for this necklace while I was washing the dishes tonight, so I made it after dinner. 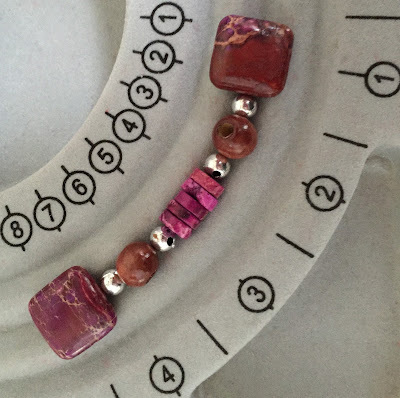 I started with pink beads made of rolled paper, and combined them with square metallic beads, silver-colored incised with a swirl design. I also used gold spheres for accents and black glass beads to add length. 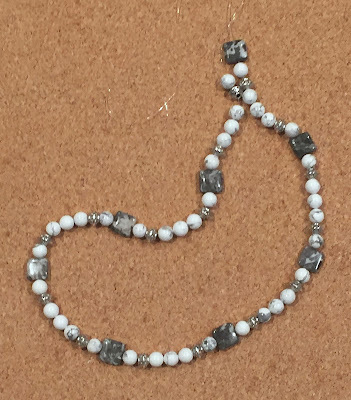 I started this necklace yesterday, and finished it tonight. 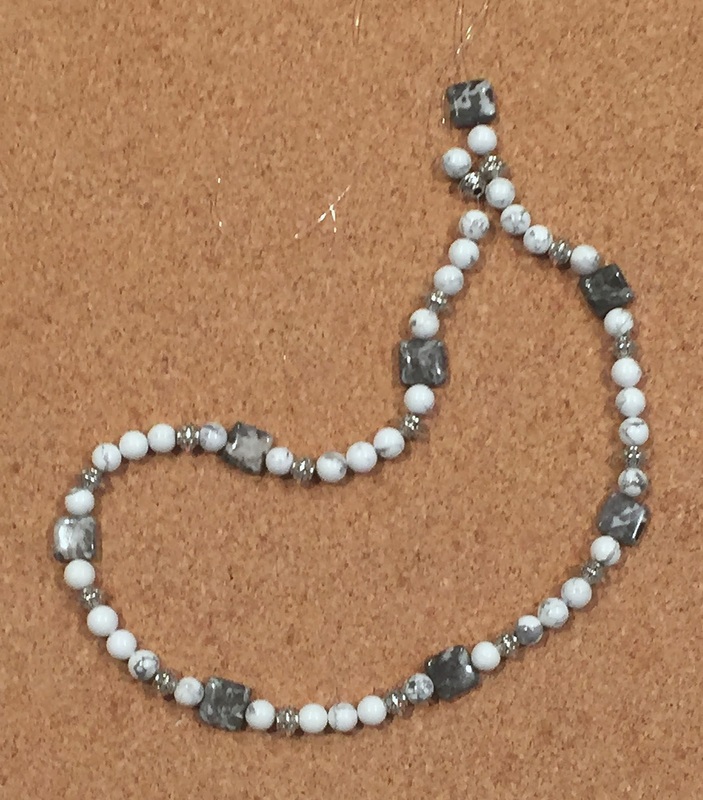 This is white howlite, black and gray jasper, and silver plated rondelles. I had thought about adding color but decided to keep it neutral. So I just added more beads for length. This is strung on a stretchy cord, so there is no need for a clasp. This is a stroke-by-stroke video created in the Brushes app on my iPad. (Brushes captures each stroke as you draw, and creates a little animation.) I finished the drawing in Painter, so today I used iMovie to splice the final drawing onto the little Brushes video. Just press play. Enjoy. This is a drawing I made on my iPad, with the Brushes app. 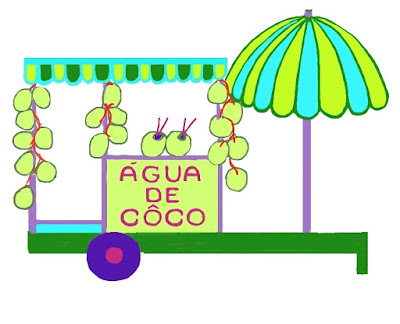 The image is a sketch of a Brazilian coconut water card. Over the past couple of days, I have been cleaning it up on my computer, using Painter. Now I think it is just about ready. I hope to use this image to make some stuff on Zazzle. 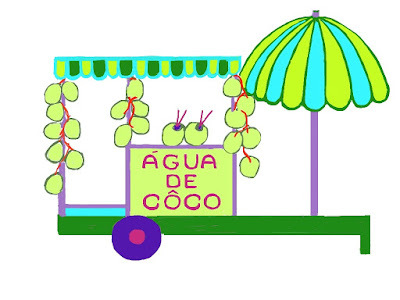 This is a sketch of a Brazilian coconut water cart. I started this on my iPad back in June, using the Brushes app. (See my post on June 26th.) I have been meaning to transfer it to my computer and clean it up in Painter. Today I finally got around to it. So far, I straightened out the lettering a bit, fixed the off-kilter umbrella pole, and straightened out a few lines. I have been working on this necklace for the past few days. Due to a number of mistakes, mishaps, and just plain bad luck, I had to restring this three times. But I like the design and I think it was worth it! 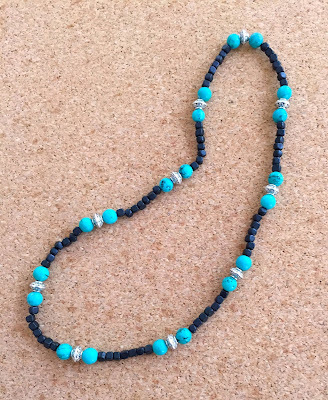 This is turquoise and black stone with incised rondelles made of silver plate. 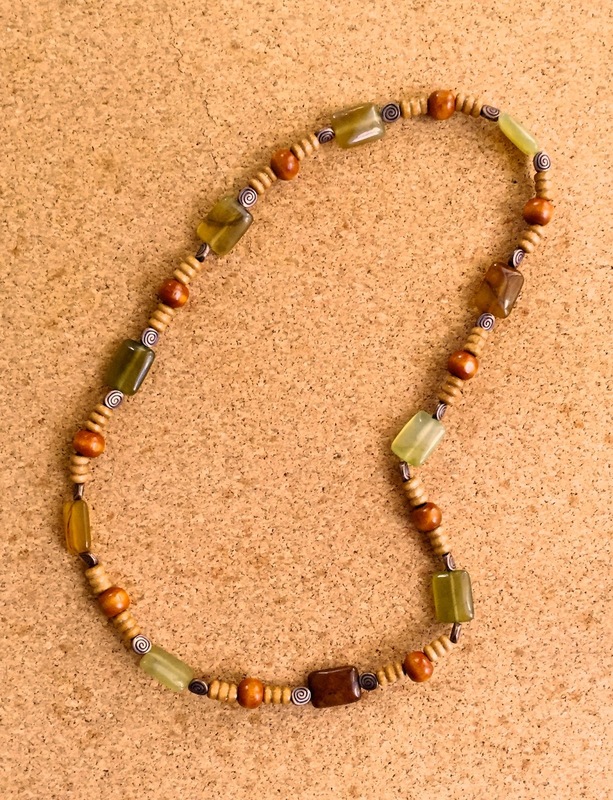 This is a closeup view of the necklace pictured in yesterday's post. 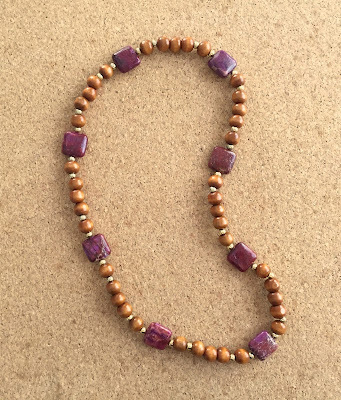 I used two kinds of wooden beads, reddish brown spheres, and dark brown cylinders that are incised. The pink beads are magnesite rondelles, and the metallic accents are silver plate. 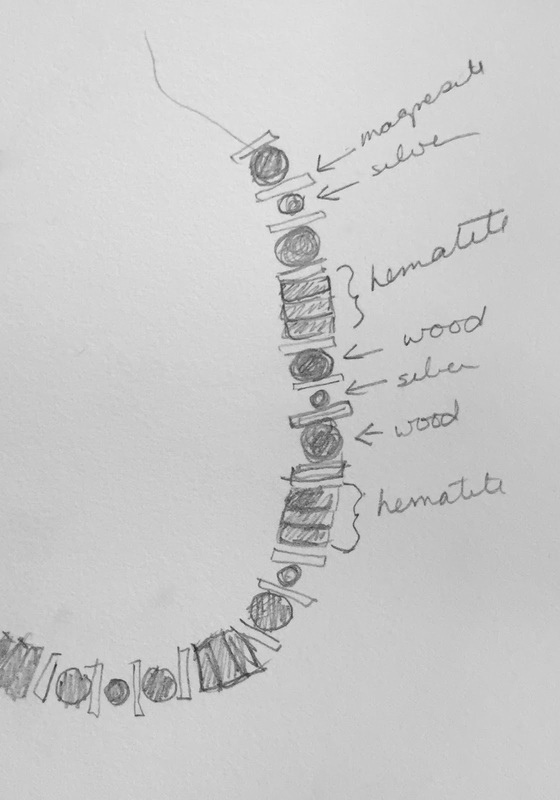 This morning, I started working on the necklace I sketched out yesterday. But as I worked, I needed to make changes. 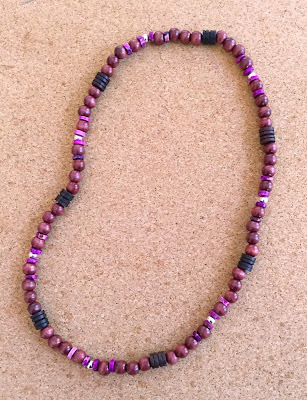 I had planned to use hematite, but the colors and shapes weren't working with the magnesite rondelles (the pink beads), so I substituted incised wooden cylinders in dark brown and that worked better. I also used additional wooden spheres next to the cylinders, for the sake of the movement of the beads as well as for length. 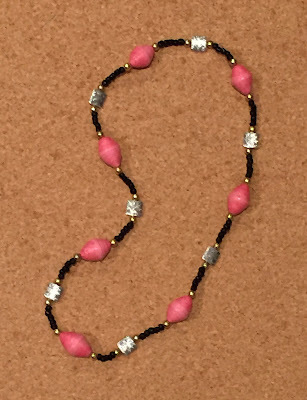 Although the end result is different from my sketch, I am happy with how this necklace turned out. 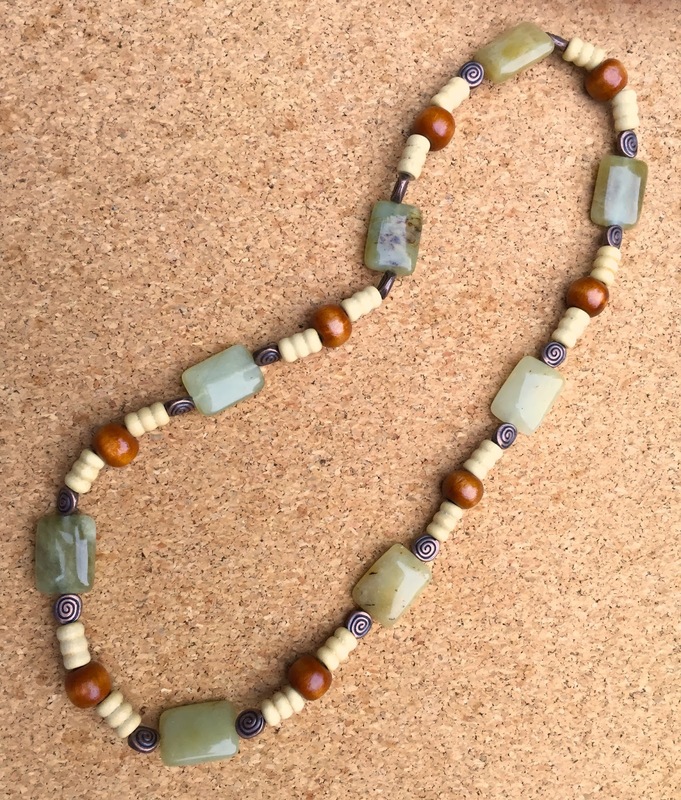 I like the combination of stone, wood, and plated silver beads. Today turned out to be busier than expected. I had an idea for a necklace, but didn't have time to work on it, not even to lay it out. So I took a few minutes and made this pencil sketch of my idea. I hope I can start making it tomorrow. 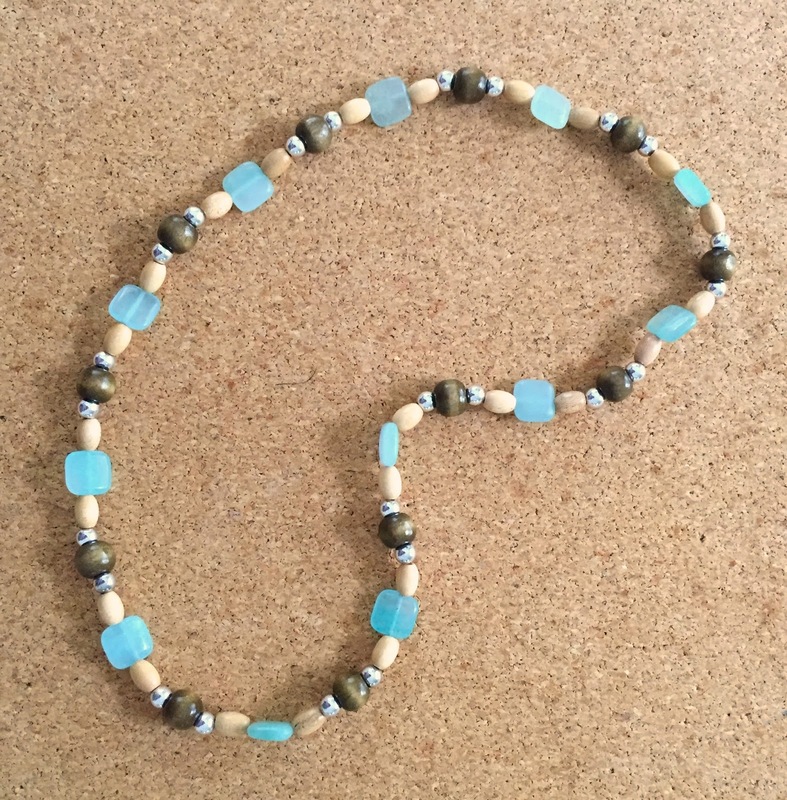 Yesterday I worked out the design for this necklace, and this morning I put it together. 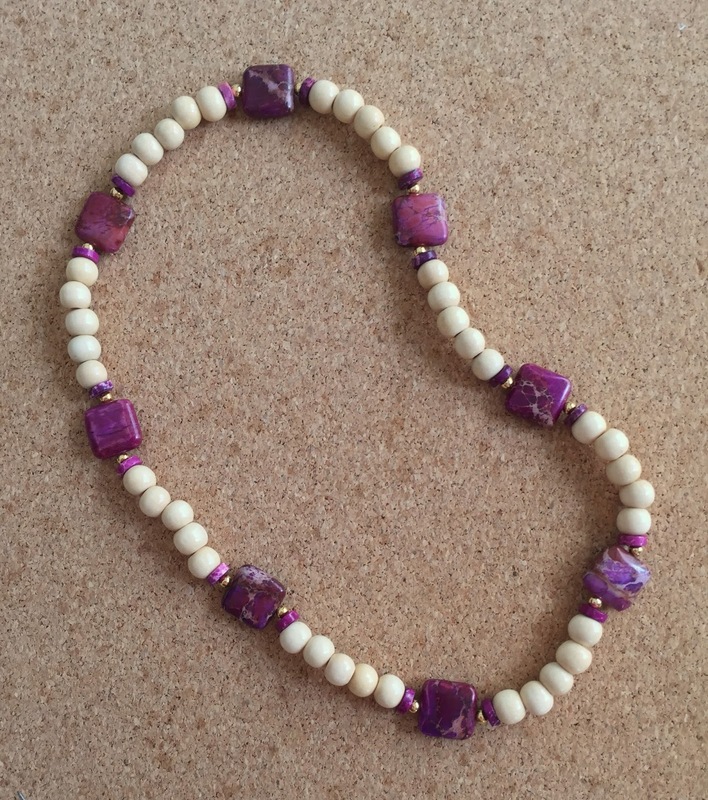 This is made of magnesite squares and rondelles, combined with wooden beads with silver-plated accent beads. This is strung on an stretchy cord, so there is no need for a clasp. 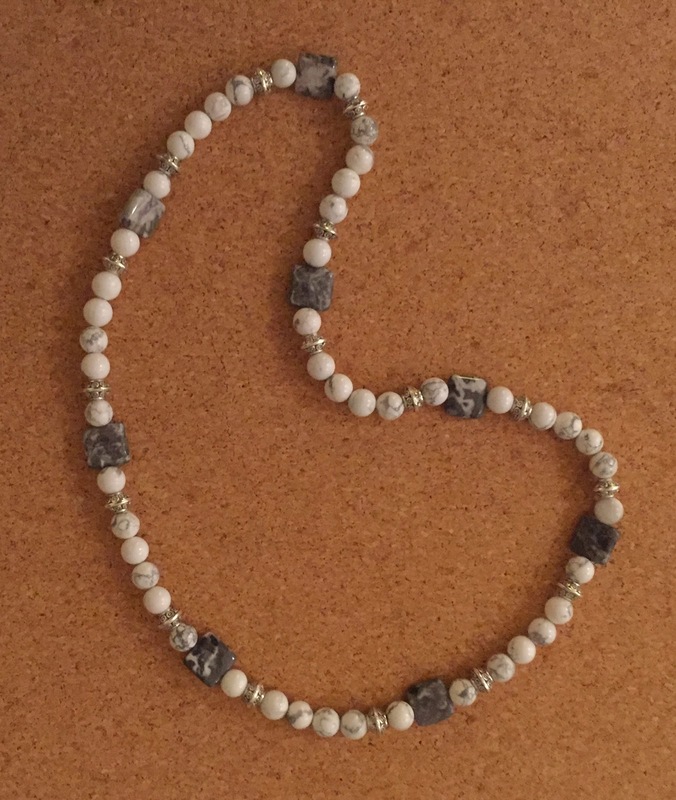 This morning I worked out a design for another necklace, though I didn't have time to string it together. Here is the basic idea, worked out on my bead board. 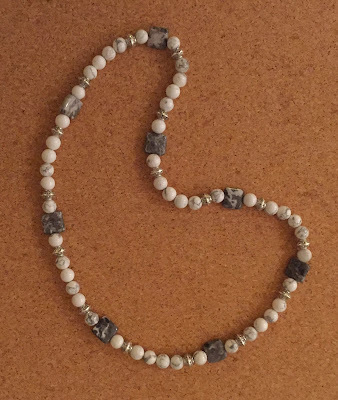 This is going to be wooden beads with magnesite squares and rondelles, and silver-plated beads. I hope to put this necklace together tomorrow. 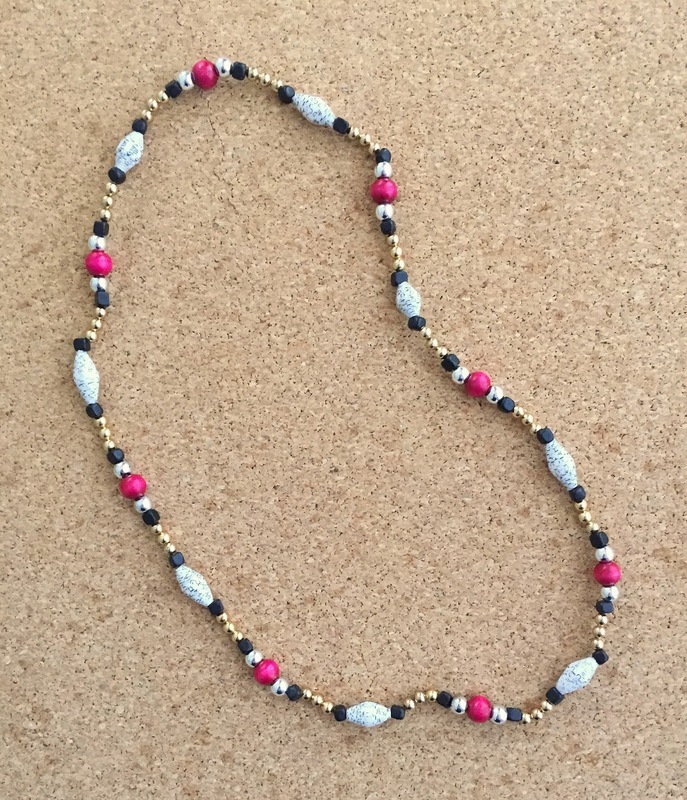 I made this necklace this morning, and the design came together quickly. This is made with pale wooden beads, squares of purple and pink toned gemstone (magnesite), along with magnesite rondelles, The gold accents are gold-plated beads. 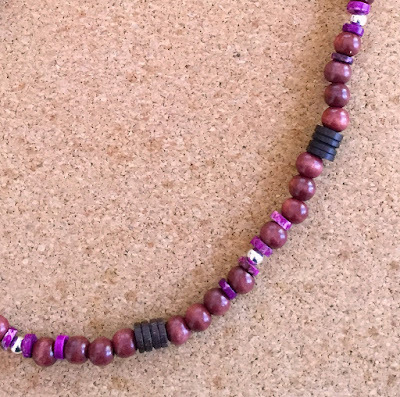 The beads are threaded on a stretchy cord, so there is no clasp. I designed this necklace yesterday, but put it together this morning. 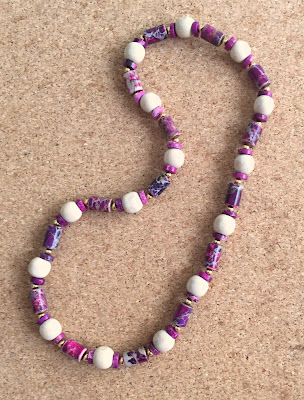 This one is made of cylinders and rondelles of magnesite in purple and fuchsia tones, combined with pale cream-colored wooden beads. I used gold plate beads as accents, and strung this on stretchy cord, so no clasp is needed. I have been working on this necklace for a couple of days and finished it last night. 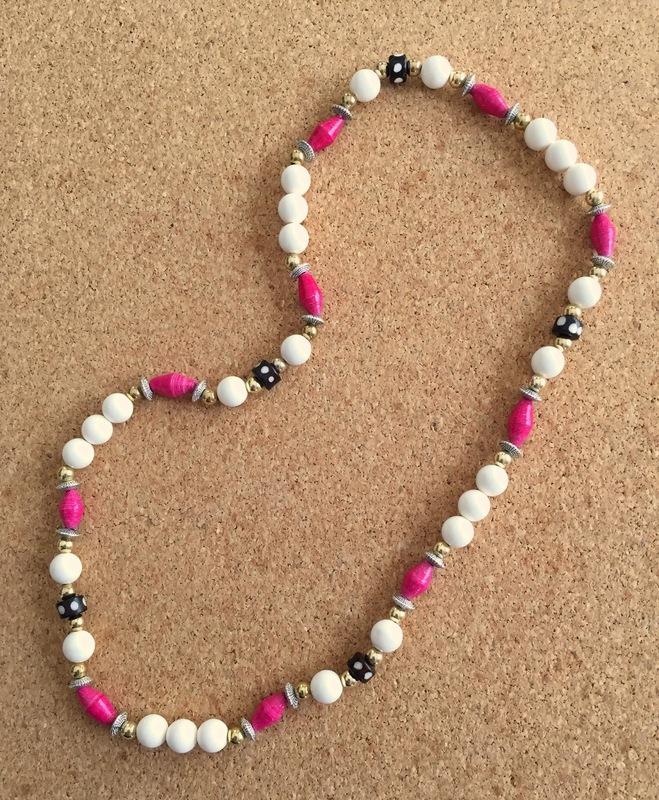 I used bright pink wooden beads, rolled paper beads in black and white, and small square wooden beads. I added metallic accents in silver and gold to finish the design. This is strung on a stretchy cord, so no clasp is needed. 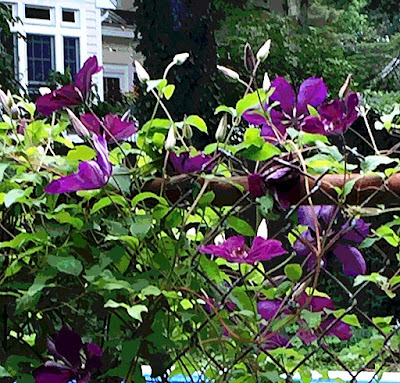 The blooms on the clematis continue to open, so I took some more photos today. Tonight I cropped this image from one of my photos. Because it was such a close-up view, I needed to adjust the focus, so I opened the image in Painter. Then I applied a posterizing effect as well. 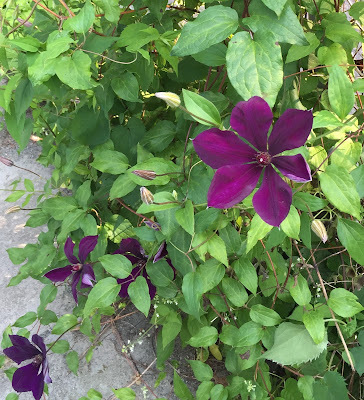 This week, the clematis in my yard finally decided to bloom, so i took some pictures. Tonight I edited this one in iPhoto. I did a little retouching and then cropped the image to get this composition. I made another necklace today. 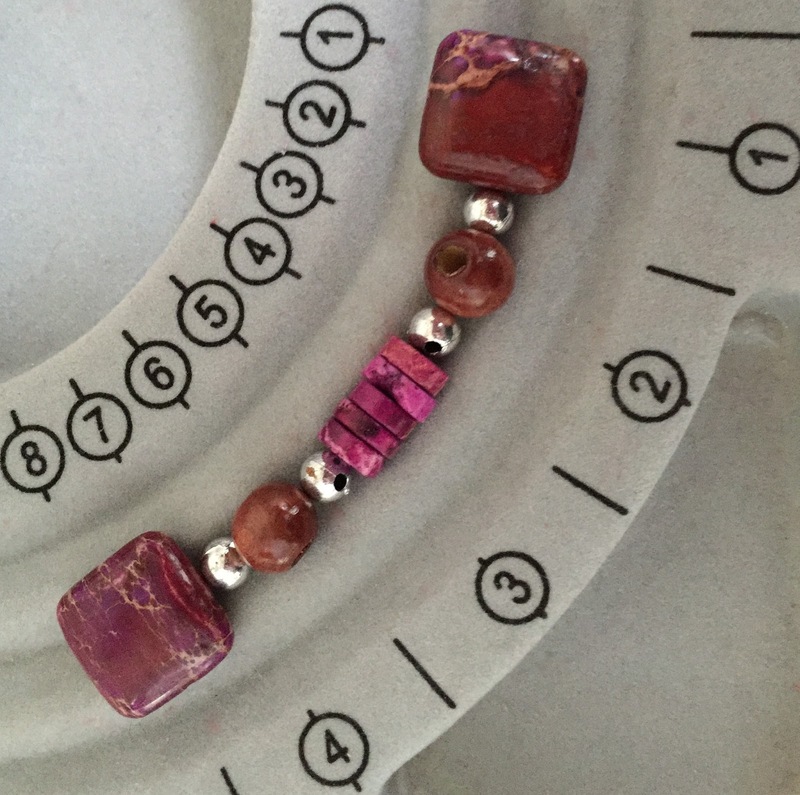 I started with some beautiful magenta and brown stones (magnesite). I added brown wooden beads and gold metallic accent beads. I designed this necklace yesterday, but finished putting it together this morning. 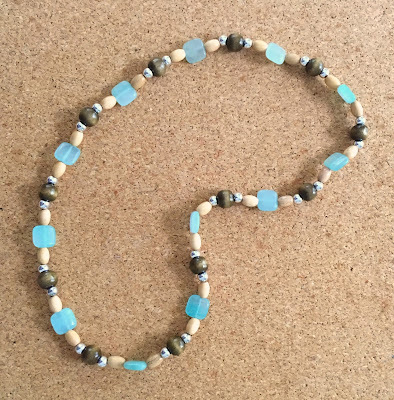 I started with square amazonite beads, and added wooden beads in two colors, and silver metallic accents. I made this necklace today, starting with the black and white polka-dot pattern beads, which I love. 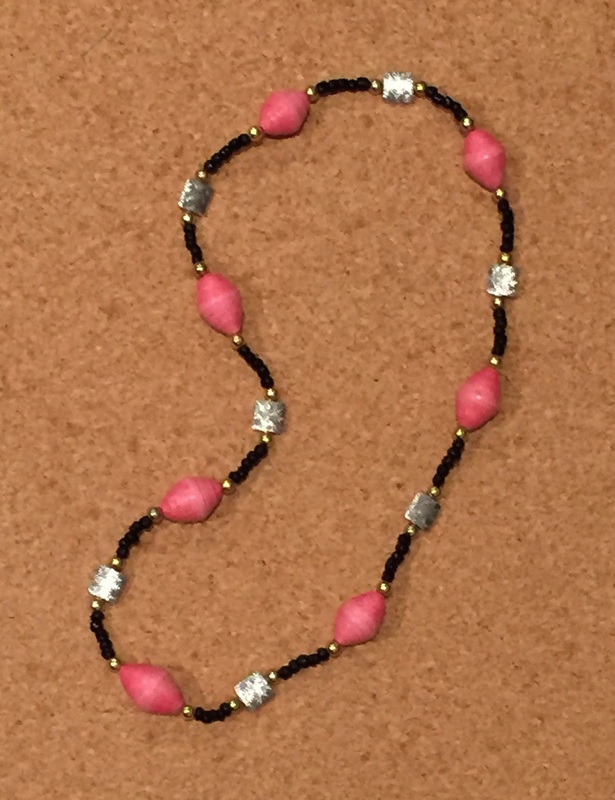 I added white beads and hot pink beads made of rolled paper, as well as silver- and gold-colored metallic accents. 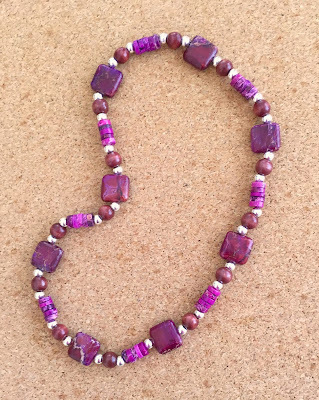 Today I finished this necklace, which I have been working on for a couple of days. 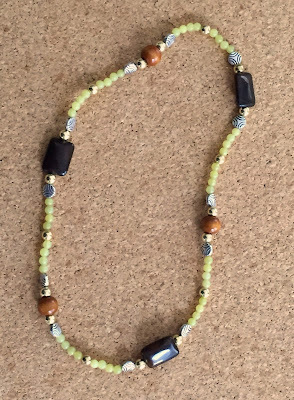 This is olive jade and flower jade, with wooden beads and metallic accent beads. This is a short necklace, strung on stretchy cord, so there is no clasp. 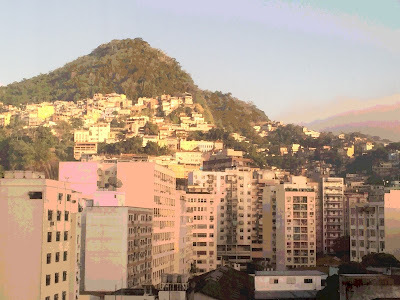 This image began as a photo that I took from the hotel room during a trip to Rio de Janeiro. The morning sun was beautiful in the original. Tonight I used Painter to posterized the image, enhancing it with bright pink and rose colors that reflect the excitement I felt waking up to Rio de Janeiro. 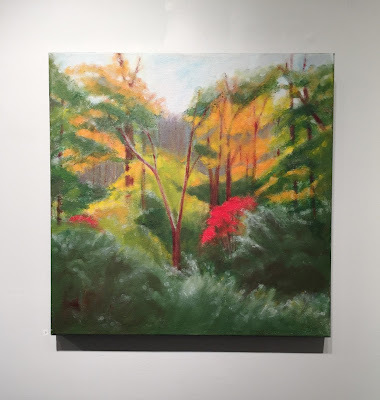 Here is my oil bar painting, on display in the gallery at Porter Mill. 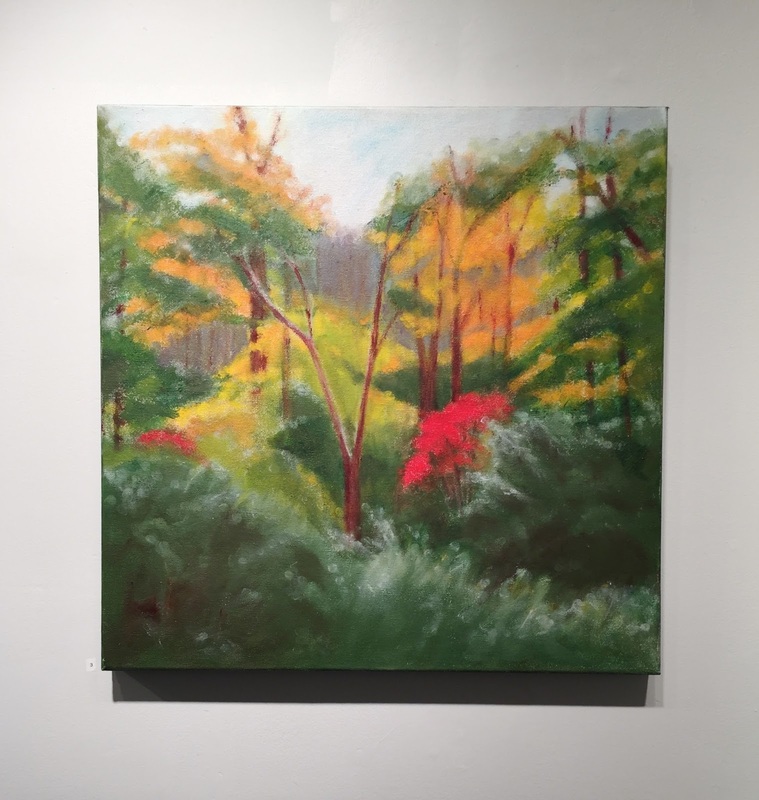 At the moment, it is part of a show, "The Artists of Porter Mill," on display through early August. I went to the opening tonight, and took this picture. I started working on this necklace this morning, but couldn't get the design to work out. I finally finished it tonight after dinner. This is flower jade, wooden beads, and copper-colored metallic accent beads. I used stretchy cord, so there is no clasp.